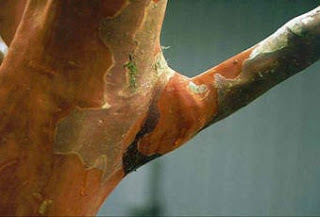 May/June is still an ideal time to transplant trees and shrubs - further information on this can be seen on the March To Do post here. Reminder: not to plant any deeper than the tree or shrub was originally. Planting too deeply creates a basin that can collect too much water. Evidence of root rot may not be visible for several years after planting and by then it'll be too late to save the plant. If in doubt, plant so that the top of the root ball is level with the soil line. 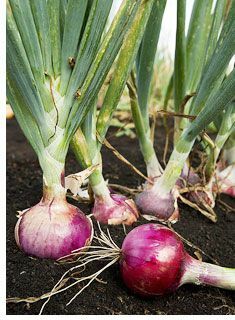 Onions are the most essential kitchen ingredient and yes, they are freely available all year long however, once you have tasted the difference you'll be making room for them in your vegetable patch! They DO take a long time to mature (up to 7 months) but if stored correctly they will also last a long time too. Choose a spot that has a sunny position, an old friend of mine used to have a bed dedicated to onions and grew some loose leaf lettuce and fast growing herbs alternatively, it worked for him as he had the most amazing onions. He also grew the white (or salad onions) as well. It is best to work your bed over very well and use a complete fertiliser/soil enricher and sow the seeds in rows 20cm apart and about 6mm deep. Keep the soil moist and the seedlings should emerge within 10-14 days. They will require thinning to allow around 10cm between each plant. Don't discard as these little beauties can be used for a lovely mild flavour in cooking. 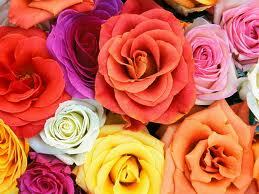 Every 6 weeks or so apply an organic fertiliser to keep the nutrients up to the growing plants. Harvesting onions is dead easy as their leaves will let you know when they have matured by starting to yellow and droop. Lift, shake off excess dirt and hang the harvested onions (with their leaves still attached) in a warm, dry spot for a week or two to allow their skins to dry. 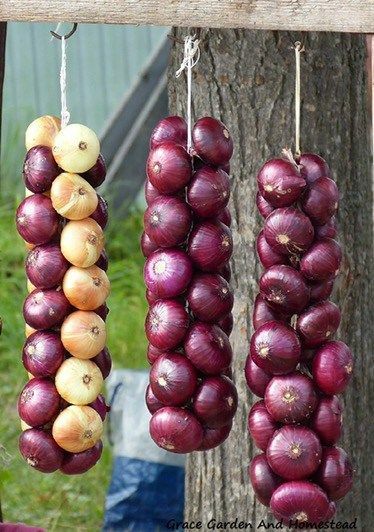 When this happens the leaves and roots can be cut off and the onions stored in a cool, airy spot until you need them. If you don't want to have a dedicated bed for onion growing why not incorporate them in your flower garden. To see some beautiful Alliums and their incorporation into the flower garden please visit this link http://www.gardeners.com/how-to/growing-alliums/7371.html which has the most stunning images. Elephant garlic is not a 'true' garlic but is closely related to the leek. It is very hardy with large blue-green strap-like leaves with a central rib. The flower stalk is quite impressive and can grow up to 2 metres high! These large pink or purple flowers appear in spring and summer. Elephant garlic does best in rich, deeply cultivated, well-drained soil and likes full sun. This 'garlic' is much easier to grow than the more conventional garlic so there are many Coffs Coast gardeners who swear that this is the way to go. Bulbs can be planted in spring, autumn or winter. Plant about 30cm apart. Bulbs are ready to be harvested when the flowers begin to dry out. This may not occur until the second year after planting. Dig up the whole plant and hang the bulbs to dry, with part of the stem attached in a shady, but airy position. The bulbs will store for up to 10 months. I visited the Jurlique farm in the Adelaide Hills, South Australia and was fascinated that they used garlic to protect their roses from aphids. The plants were enormous and to be totally honest, not the most beautiful thing to have as companion plants for roses however, they were totally committed to this natural approach to what can be a pesky problem. You can see a lot of information from the Australian Garlic Industry Association website. Also there was a recent post - growing garlic on the Coffs Coast on this website. Paper daisies Bracteantha bracteata is believed to be the first cultivated Australian daisy and the first of our native plants to be hybridised. 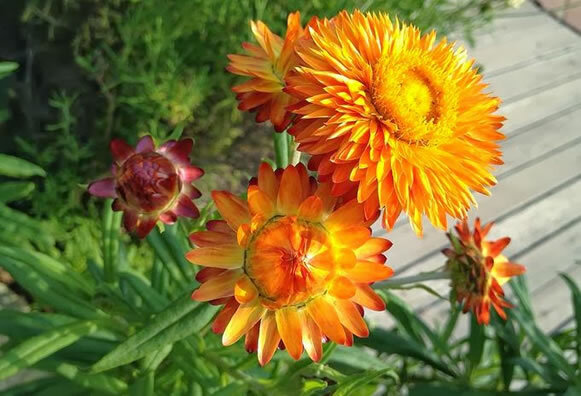 If you would like to read more about paper daisies, the Royal Botanic Garden Sydney has a lot of information, history and how to grow paper daisies. Paper daisies hold immense tactile appeal for children, the feel of these wonderful native flowers is simply irresistible. 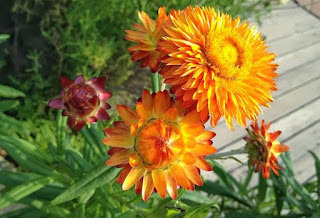 To create perfect growing conditions for these flowers select a sunny position (perhaps even full sun) and prepare the soil well by removing all weeds and forking lightly over the ground. A sandy soil is best for paper daisies, if you have clay improve drainage by working in compost, sand and gypsum or alternatively create a raised bed filled with a free-draining mix of compost and sand. Water the bed before planting. The seeds are very light so best not to try planting on a very windy day. You can mix the seed with some sand or course potting mix to make it easier to broadcast. Scatter seed evenly over the bed and cover with seed raising mix or soil. Do not water until the seeds have germinated - this should be around 7-10 days. For the Coffs Coast it is best not to overhead water these plants - apply the water to the base of the plant to avoid any fungal problems with the foliage. There are some wonderful mixed hybrid seeds available and they come in colourful blends of red, white and pink. The flowers will be in bloom approximately 14 weeks after sowing so they should be looking fantastic for the Spring Garden Competition in September. Visit Yates yellow paper daisies for further growing hints and information. These strawberries may not be huge and succulent like supermarket ones, however they are just so sweet and have that wonderful rich strawberry aroma. 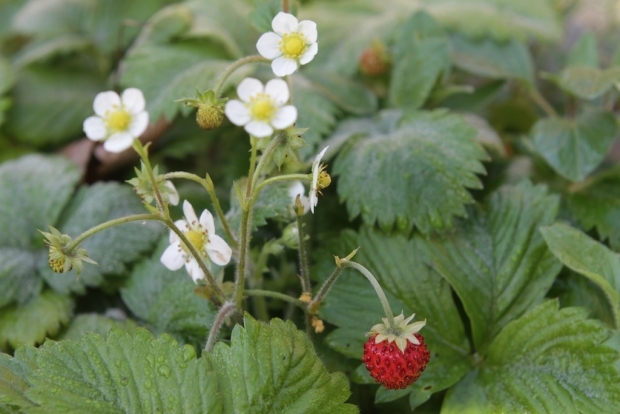 Alpine strawberries are a runnerless cultivar and are terrific for pots or as a fragrant border for the vegie or ornamental garden. 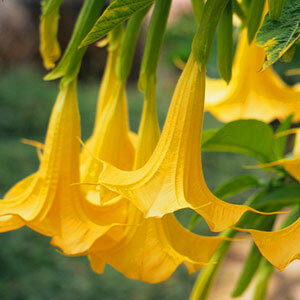 Now is the time to order some plants from a supplier like The Diggers Club if you are a member. These little beauties are not available from the supermarket as they only last a day or two once picked. If space is an issue for you, consider growing some space-saving climbing peas. They can be grown along a fence, a purpose built trellis, a tepee, tripod and even an arch for an added design element in the patch. By growing vertically, the plants get plenty of sunshine so will crop very well. As part of the 2016 Spring Garden Competition, schools participated in a growing competition - 'Snowpea Teepee' was the vegetable chosen for this competition. It was a huge success with most schools producing some rather super plants and produce and there were stunning teepee constructions as well. 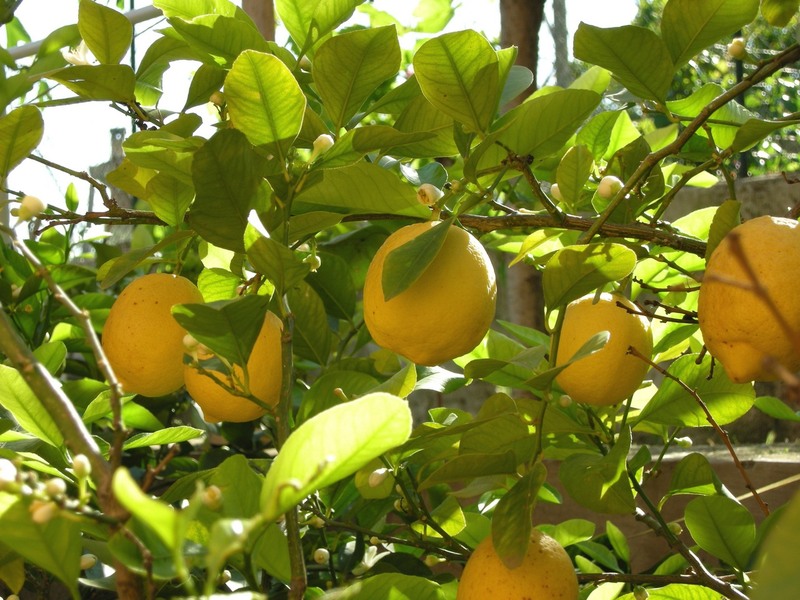 April is an excellent time to plant citrus trees. You can order these from a dedicated citrus grower, or your local nursery. Feed your citrus with a commercial citrus plant food, to really get it going. As we've had a lot of rain recently it is important that these heavy feeders are looked after. If you are looking for more detailed information on how to grow citrus Engalls have been grafting, growing and supplying citrus for many decades and their website has some excellent information. Parsley takes a long time to germinate so it is always worthwhile to stagger seed sowing. CHGC member Simon did an excellent presentation at the April meeting about growing your own herbs. 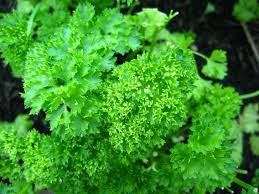 Some folk like to grow their parsley as a foliage plant in their garden beds, rather than just the vegie patch. This method is fantastic as the plants add texture and contrast to other plants - the trick for us is to keep something? (rabbits, hares, ducks or roos) from eating more than us! I have devised some wire domes to protect the plants from these marauders. This time of year is an excellent time to divide spring-flowering perennials and replant. Also if you have been wanting to add to your collection of these plants now is a good time to plant them so they can establish before the cold winter temperature sets in. 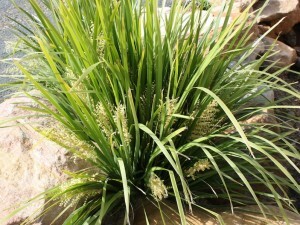 Plants such as Miscanthus, Lomandra hystrix and Dianella can be lifted, divided and replanted at this time of year. Use a fork to remove the clumps, cut back old canes and foliage, cut up into smaller pieces, re-pot excess or plant elsewhere in the garden. Put some organic fertiliser in the hole before planting, water well and it's all done! 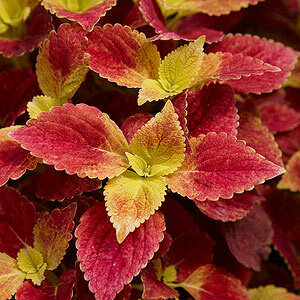 Take cuttings of your favourite coleus and either share them with friends or bring along for the trading table at a CHGC meeting. They will strike really well if placed in a glass of water with a little Seasol added. They can then be potted on into good quality potting mix. Keep the cuttings protected from the cold during winter and then plant them out in the spring. Even though we don't get very good autumn foliage colour here on the Coffs Coast (most vibrant autumn coloured trees just do not flourish here) some interesting autumn colour can be had with growing Crepe Myrtles (Lagerstroemia). There are some wonderful varieties available and Jane did a presentation at a meeting last year and her information can be found here. I just adore the mottled, smooth trunks of Crepe Myrtles and feel they are worth inclusion in any garden for that reason alone. As the weather has cooled down it is more pleasurable being out in the garden. Still keep an eye out for aphids, slugs, snails and grubs and caterpillars, particularly on your brassica vegetable crops.